Today I made the effort to get my arse into gear and go fishing. I even planned to have my main meal ready at lunchtime so all I'd have to do when I got back was make a snack. Despite my meticulous preparations I managed to forget my new woolly hat. 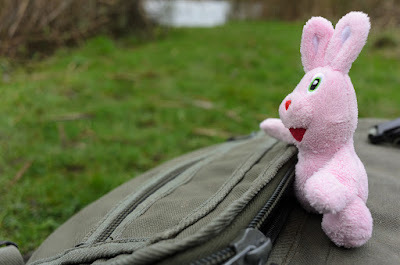 I'd removed my old one from the rucksack, but not replaced it with the new one. Thankfully although there was some north in the breeze the day was reasonably mild and my tatty baseball cap kept my head warm enough. Thinking about it leaving the new hat behind might have been a good move as I was giving a new pair of boots their first fishing outing. Two new items on one session would have been a sure fire blank inducer! Were there a Royal Society for the Prevention of Cruelty to Boots I'd be banned from keeping them for life. I never look after my footwear. I don't willingly abuse them or anything, I just neglect them. 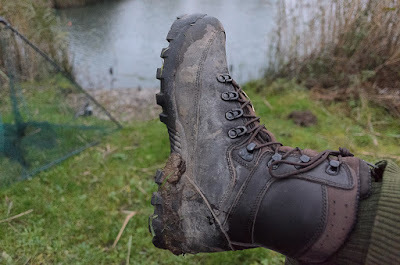 Not only do I wear my boots for fishing, I put them on to tramp around with my camera. Salt water when I wear them to paddle about at the beach when I'm out with my camera probably does them no favours. As a consequence the leather always ends up cracking and letting in water long before I have worn the soles out. Last winter I just about managed to keep my feet dry, but a few dew laden mornings this summer saw my socks getting damp. It was time to stump up for new boots. I could wear my Muckboots, but I prefer an eight inch leather boot. Mostly because I can't drive in wellies and am too lazy to swap from my 'day boots' to wellies when I get to where I'm fishing and swap back to go home. Boots on as I set off and straight out of the car to the swim. Old habits of fishing popular waters and having to beat the hordes die hard. Time will tell how long this pair last. If I get three winters out of them it'll be par for the course. I wasn't sure how a clean Fred would affect my luck either, after he'd had a bath (i.e. spin in the washing machine and tumble drier...) a couple of weeks ago. As it turned out none of this voodoo resulted in a blank. Although one small jack that took a liking to a headless joey mackerel wasn't what I'd have scripted it was better than catching nothing. As soon as the float wobbled it was obvious a small fish was playing with the bait. The float hardly moved and just a few ticks at a time were made by the baitrunner. Once more there wasn't much to see in the way of birdlife. A small flock of goldfinches twittered as they fed in an alder. A sparrowhawk made a close flyby, agitating a blackbird as it reached the other side of the lake. An indecisive flock of fieldfares flew over heading west, turned and flew off and out of sight in a north easterly direction. After an hour and a half I moved to a spot where I could cover more water. One bait in close, one to another feature and one out into more open water. Nothing happened apart from a reed stem catching one of the lines and making the remote bleep in my pocket. With half an hour of light left I repositioned all three baits to places they remained until I packed up in the dark. Not the most successful of sessions in terms of fish caught, but one which renewed my enthusiasm and cleared my still snuffly sinuses a little. One thing that the session reminded me was that I need to restock the freezer. There's not a lot of choice in it at the moment. Not that I'm sure the pike in this place are too fussy. It's just nice to have a selection of bait sizes if nothing else.